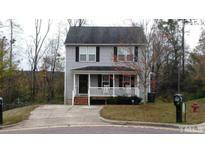 Below you can view all the homes for sale in the Emerald Pointe subdivision located in Knightdale North Carolina. Listings in Emerald Pointe are updated daily from data we receive from the Raleigh multiple listing service. To learn more about any of these homes or to receive custom notifications when a new property is listed for sale in Emerald Pointe, give us a call at 919-626-3591. Home offers large screened in porch perfect for relaxing and an unfinished basement. Must see! MLS#2247955. 2731. This spacious floor plan comes with a finish basement, great for entertainment, children play area or just for relaxing.This 3 story home open floor plan with 3 Bedroom, 2 full baths and 2 half bath a fireplace in the living room is just waiting to welcome you home. MLS#2225911. 2722.